This past weekend was miserable outside and when stuck inside what to do....well I can always find something to do, clean up the house-NOT, laundry-NOt, make meals....only when necessary, or make more door tags. I got this idea after getting an order I had placed with Artchix and I got a mermaid pkg with images and a couple of chipboard mermaid tails. 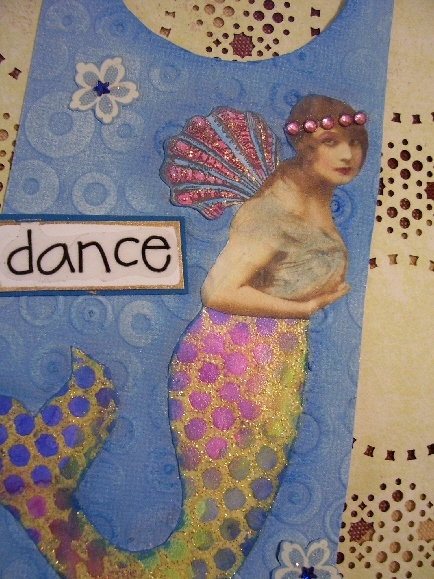 So I got thinking why not make some mermaids on door tags and this is what I came up with. These are not the mermaids out of my order but I did trace one of the tails onto card stock after I had stamped and embossed in gold EP the Clearly Impressed background stamp from Stampington onto white card stock. Then I got out 3 colours of my Twinkling H2o's and painted and blended the 3 colours randomly all over the sheet. I then cut out my tails. Now they look scaly and more like fish tails. I then printed off just the top part of the ladies bodies, attached the tails. I also ran some gel pens along the edges of the tails and rubbed the ink with my fingers to just darken them and stand out on the background papers. I embossed my tags using a CB EF and then just played with finishing touches. 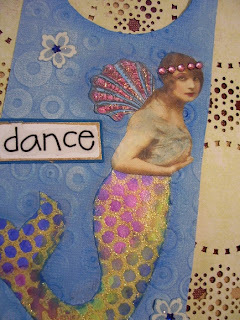 I love how these turned out and off to post my link again on Jeanie's blog. If you would like to play along simply click on Jeanie's Door Tag Challenge button to the right of the screen and it will take you directly to the link with all the deets. I will say these are addicting and fun and a great way to use up scraps and just bring stuff out you have forgotten about and just play. Thanks for dropping by and stay tuned for more of my musings. Oh my goodness - didn't these come out gorgeous! And do I spy sequin waste? LOL. Love these tags. I love that you embossed the paper. I haven't tried that. Gosh, there are just so many ways to go with these! As you said, it's good thing to use to try out a new technique before applying it to a larger artwork! Your doorhangers are lovely! Beautifully done! Oh the doorhangers are stunning. Another cute door tag! Love your mermaid.